ICONEM is currently collecting records of Palmyra’s monuments in order to establish the extent of the damage and to organize the restoration campaign. We’re looking forward to give the city its cultural role back as one of the icons of world heritage. 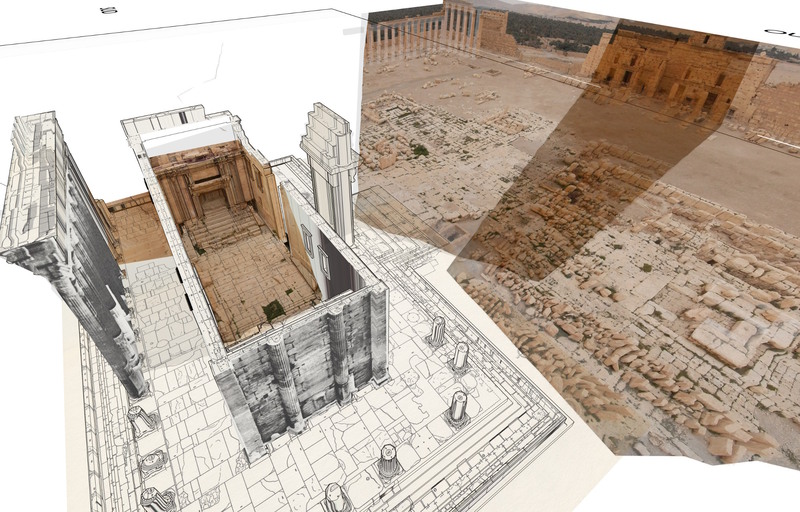 In partnership with the DGAM, ICONEM just carried out a preliminary reconstitution of the Temple of Bel in Palmyra using 3D photogrammetry. The Temple of Bel was indeed destroyed by ISIS fighters, who also demolished the Baalshamin Temple, the triumphal arch, and several cairn (circular stone tombs). This 3D model provides a first overview of the sanctuary, which is going to be used as a reference by the restorers. This video is part of the “Syrian Heritage Project”, a series of works produced using photogrammetry, in partnership with the DGAM: architectural plans of the Umayyad Mosque’s courtyard in Damascus, virtual tours of both the Umayyad Mosque in Damascus and the archaeological site of Ugarit, and most recently a virtual tour of the Jableh Theatre. All these videos are also available on the “Syrian heritage” page and on the DGAM’s website. Thanks to the mine-clearing team’s work, the DGAM is going to be in possession of a plan indicating the location of the explosives planted on the archaeological site. This plan will provide a visual estimation of the stone blocks’s degradation. Some DGAM staff members had the chance to visit the site last week, during a period of stability. DGAM experts are going to undertake specific documentation works using advanced technology, in order to produce the necessary documents for the restorations. This work is going to be done in accordance with international standards that give priority to the site’s authenticity. This preliminary damage assessment on the field last week, along with pictures produced by visitors, media reports or satellite imagery show that several architectural features, such as the podium, its stairs, its monumental portal, foundations and several columns are in good condition. These blocks will be re-used and similar ones from the neighboring quarries will replace the missing parts. In this way, monuments can be reconstructed authentically. The result of this process will be subject to a full revision by the UNESCO as Palmyra is inscribed on UNESCO’s World Heritage List. The Temple of Bel is one of the most famous monuments in Palmyra. Built in 32 AD, it has an outer wall of 200m by 200m, preceded by colonnades. The sanctuary, 10m by 30m, is located at the heart of the monument. It includes a monumental portal in its center and two altars, surrounded by porticos. More information about Palmyra’s revival is coming soon: in partnership with the DGAM, Iconem plans to conduct an analysis of the damages undergone by the site, and thus contribute to its restoration.